104 Marion, Iowa. March 12 1923 The Cary Club met at the home of Mrs E W Griffiths. The meeting was called to order by the president Mrs McKean. Eight members responded to roll call with Mrs Grace Griffiths Hanson as a guest of the club. The Secretary being sick there was no minutes to be read from the last meeting. The following program was given. 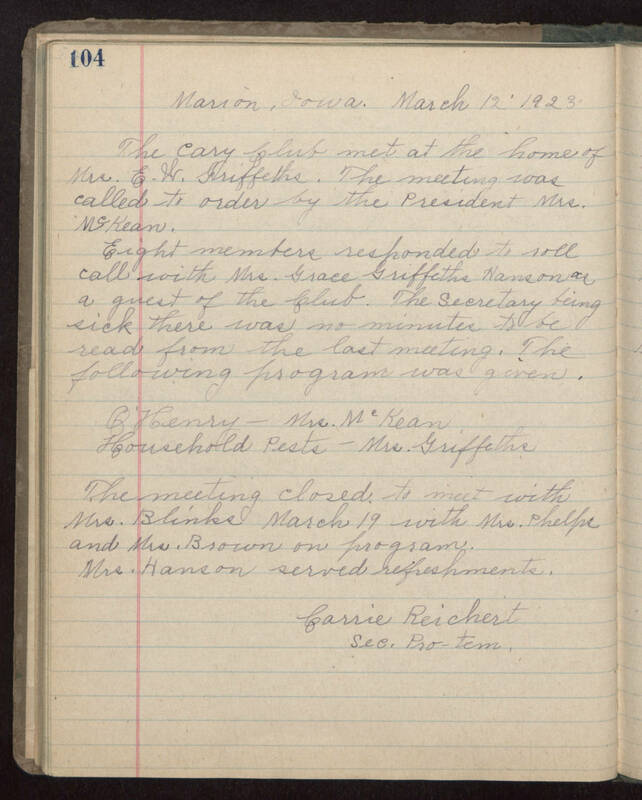 B'Henry - Mrs McKean Household Pests - Mrs Griffiths The meeting closed to meet with Mrs. Blinks March 19 with Mrs Phelps and Mrs Brown on program. Mrs Hanson served refreshments. Carrie Reickert Sec Pro-Tem.